« Who’s Responsible for Success? I learned from a very early age that life isn’t fair, and you don’t always get what you want. It was such a big part of my life; growing up in a house with 6 kids, two adults, and a middle class income; that I came to believe it was our family motto. This philosophy is so common, I later realized just about every middle class family has this belief. Later, I would tell people, “I always get what I want, even if it takes years.” While I was saying that outside, deep down, my “family motto” would kick in, and tell me that I will never get everything I want. That same inner chatter would tell me “You can’t afford it”, or worse, “You don’t deserve it.” As a result I would spend my life wanting things I could get easy, and believing that anything more was just too far out of my reach. This is a question only you can answer. Each one of us is an individual, and no one else possesses the insight to our hearts, and vision. There are, of course, several methods to finding your answers and no one method will work for everyone. I will give you the method I used, but there are numerous books on the subject, and the internet is loaded with them. The method in today’s blog comes from the book, “The Success Principles” by Jack Canfield, and I would recommend this book to anyone starting their journey. The thing to keep in mind about this exercise is that there is no time limit. You can take 1 day, or 1 month. Don’t worry about whether your list sounds realistic or not; you are just writing down your wants. If you currently make 25,000 dollars per year, and want 10,000,000 dollars per year, write it down. Don’t let anyone, including yourself, tell you that you can’t do it. These are your wants, your dreams, and no one has the right to take that away from you. 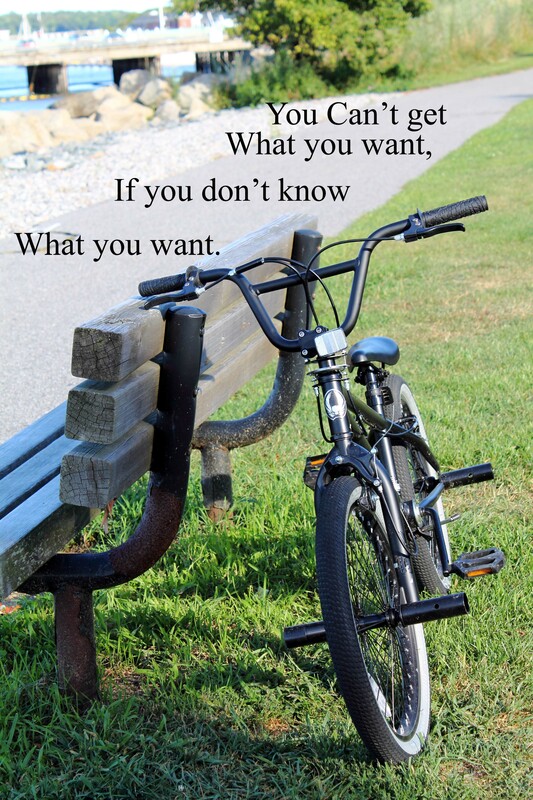 The point the picture above makes is that knowing what you want is the only way to get what you want, so find a method to get your wants down on paper, so you can focus on them, and start finding ways to achieve them. Not only can you do it, but you deserve it. As a side note, This week, I have officially started the company JTS Publication, and the website www.jrnytosuccess.com where you can see my videos, and I am selling the pictures I’m putting on these blogs. You will see other pictures that haven’t appeared here yet, but they will be used on future blogs. Check it out, and please share this blog with others. Thank you. This entry was posted on October 6, 2013 at 9:42 pm and is filed under Success. You can follow any responses to this entry through the RSS 2.0 feed. You can leave a response, or trackback from your own site.